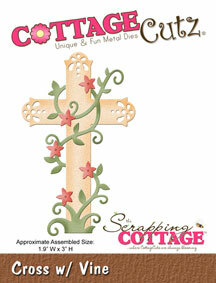 Hello, Scrapping Cottage friends! Happy Wednesday! This is Beverly Polen from Guneaux Designs, and I am pleased to be a guest designer today! Because Sunday is the Easter holiday for Christians, my card share for you is an Easter card that showcases the CottageCutz Cross With Vine Die. 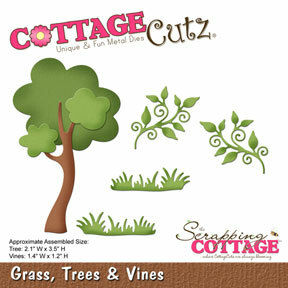 But before I discuss the card, I want to draw your attention to the new CottageCutz Baby Release for April. 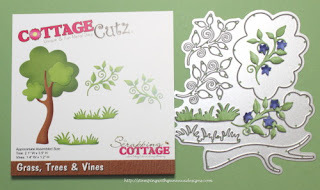 These new dies are adorable, and I encourage you to check them out. For a limited time, you can enjoy a 25% discount on the dies! Here is the Easter card I made for your enjoyment. 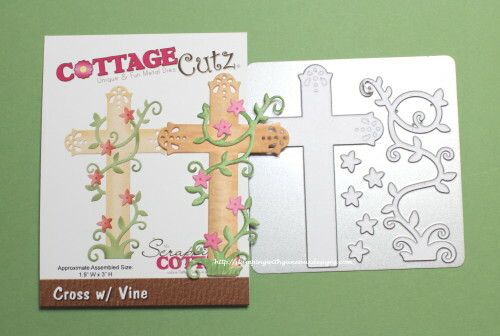 Cut out the cross, vine, and flowers using the CottageCutz Cross With Vine Die. 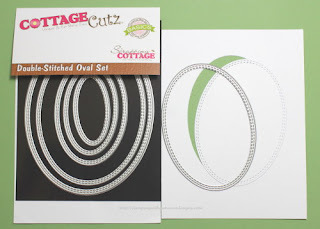 Cut a 4" x 5-1/4" piece of white card stock and use the third to the largest CottageCutz Double-Stitched Oval Die to cut an oval in the center of the card stock. If desired, emboss the negative piece. 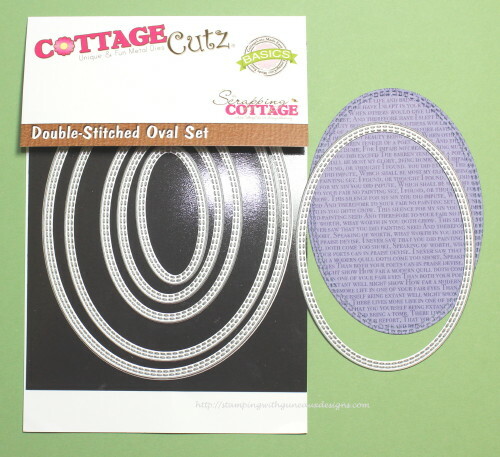 The oval cut out will not be used. 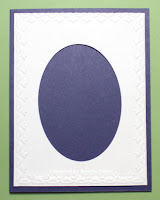 Cut an oval from a piece of purple designer paper using the same die. Cut out three ovals from white card stock using the second and third largest dies from the Double-Stitched Oval Dies. Glue the three ovals together. Cut out and color two vines and grass using the CottageCutz Grass, Trees, and Vines Die. 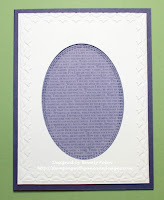 Cut a 5-1/2" x 8-1/2" piece of purple card stock, fold in the middle for the card base, and begin assembling the card. 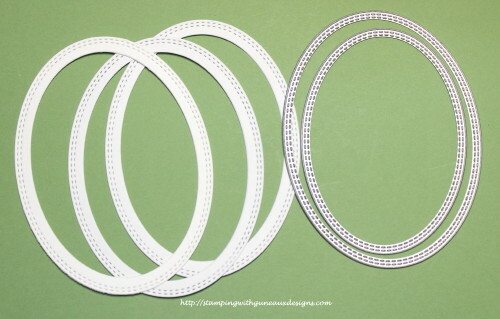 Adhere foam tape to the back of the piece of white card stock with an oval cut from the center. Attach this to the center front of the card base. 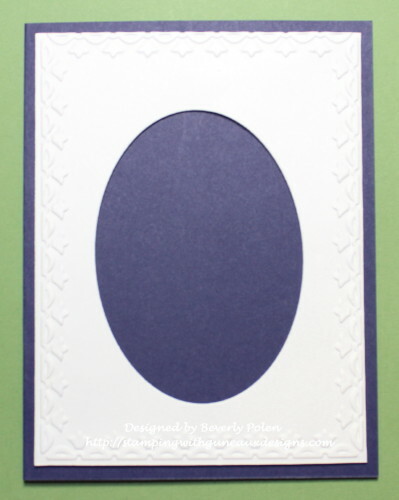 Attach the purple designer paper oval inside the oval on the card front. Attach foam tape to the piece of grass and adhere it to the bottom of the cross. Attach foam tape to the cross and adhere it to the center of the oval on the card front. Attach the three glued ovals onto the card front. Attach the vines with flowers around the oval. Add a sentiment. I added one inside the card. Enjoy the card and come back tomorrow! Remember to check out the new baby dies! 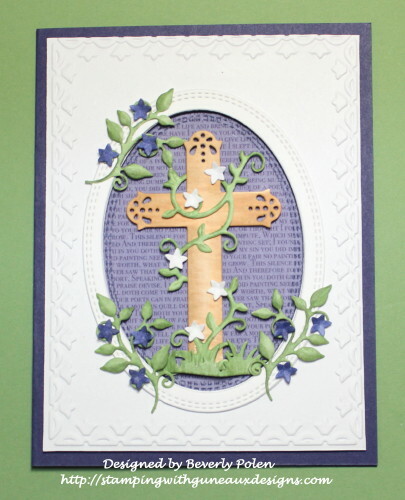 Gorgeous Easter card love the beautiful cross and all the vines so pretty!